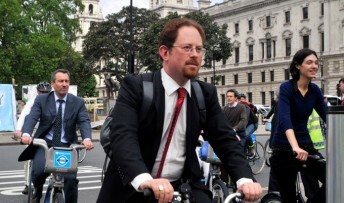 MP Julian Huppert has been named as one of the most influential people in the UK cycling scene. Julian was recognised jointly with Ian Austin MP as co-chairs of the All-Party Parliamentary Cycling Group. They are included in a list of 50 leading names in the world of cycling such as Tour de France winner, Olympic gold medallist Bradley Wiggins, Davie Brailsford, the Performance Director of British Cycling and Brian Cookson, President of the Union Cyclist Internationale, the governing body for sports cycling which oversees the world championships. The Brit List was drawn up by cycling magazine BikeBiz in association with the London Bike Show and featurs athletes, innovators, brand leaders, media and politicians among others. He said: “This is a huge honour to receive recognition alongside outstanding athletes and other great names in this field. “Cycling has come a long way in the last year following our success in the Tour de France and the Olympics and more and more people are taking up the sport. In Cambridge we are so fortunate to have the Tour de France, the world’s most prestigious cycling event coming through our city and I hope this will encourage even more people to start cycling.